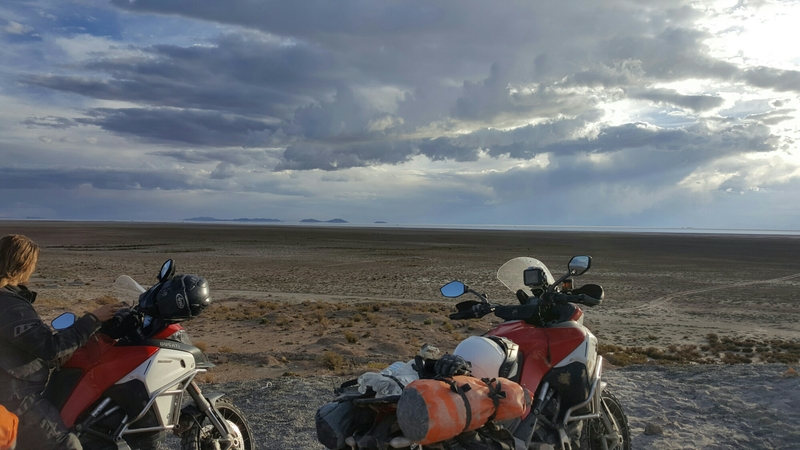 Seems the route on my map is not too well known by locals.we ask about the dirt road from Tambo Tambio to Uyuni and nobody knows about it, they know a paved road but it’s much further East. Eventually we find it, lose it, and find it again. No road signs and not reliable information from people we come across. My map only has one road but there’s numerous here. This route is supposed to be part of the Dakar rally. When it’s wet this route would be really bad and it was really wet just a few days ago so plenty of signs of past vehicles struggling, big ruts, multiple detour tracks, and still some signs of flooding. We were occupied with sand and navigation from washed away roads so no pictures or video until late in the day. At one of the few times we saw someone to see if we were on the right track the woman at the tractor confirmed it was b the right road but pointed to her waist as to how deep the water crossing is ahead, about twenty minutes. Maxxx asks how wide the river is and she motions it’s really wide. Not what we wanted to hear.But knowing it dry now as hasn’t rained in three days we have to evaluate for ourselves. Sure enough…the river was wide and flooded, but not now. Signs of major depth and width likely less then a week ago. Now it’s wet, firm mud leading to about what’s now a ten foot crossing about eight inches deep with a steep bank on the other side. Maxxx is very hesitant, he feels the firm mud will not hold the weight of the bikes and the steep bank may be too much for the bike. I have my concerns but want to move forward. He says “you go first”, this is not his usual response. I think he’s still shy from our lift push pull water crossing. I decide to go, I start out slow and know to make the bank on the other side I need speed, so I increase speed as I hit the water and all concerns are dismissed as I cross the water and go up the embankment. Much easier then we thought. Maxxx hops on his bike and repeats. We move forward. Sand washed out road, no mud. GPS has no road tracks but our position in relation to the Salar look good. Shortly we hit a small village that has some trucks and people, a good sign of movement. The road starts to get better and wider. It’s majorly waved away in places but there’s detours around it. We feel much more comfortable. Further down the roads solid and we see a couple trucks going the other direction. 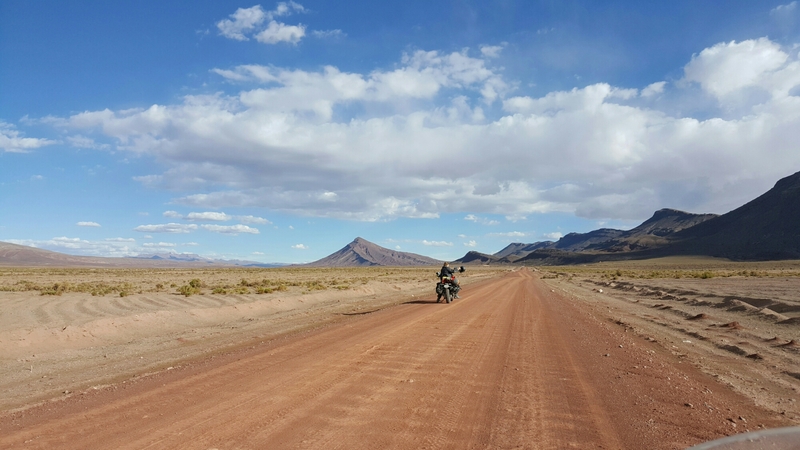 We eventually hit pavement in Chita and it’s smooth sailing all the water to Uyuni. We stopped for another photo of the Salar. Uyuni we get a room and food. The train cemetery tomorrow and then south west to the Lagunas. What is a train cemetery? Where they take the old trains, dismantle all the useable parts and leave them to rot.